If you are a heavy user of remote desktop connections, and you haven't tried Terminals, then give this free, open source utility from CodePlex a try. 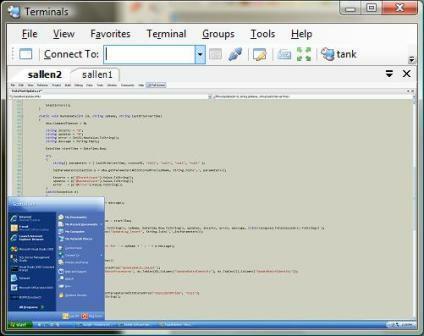 "Terminals is a multi tab terminal services/remote desktop client. It uses Terminal Services ActiveX Client (mstscax.dll). The project started from the need of controlling multiple connection simultaneously." One of the great features in Terminals is the ability to set up a "group". One click on a group can open multiple RDP sessions at once. Terminals can also auto-scale a remote desktop to the window size, and setup a default desktop share for drag and drop operations into the remote desktop window. Tip: If you are using a nonstandard port for RDP, don't enter the port number with the computer name (machine.foo.com:3399). This syntax doesn't work in Terminals. Instead, enter the port in the Remote Server Port textbox on the Advanced settings tab. Do you find Terminals better than the Remote Connections MMC snapin from the server 2003 admin pack? That's what I generally have been using. The two features I find I really like in Terminals are groups (one click opens three servers) and the auto-scaling. I haven't found a comparable feature in the MMC snap-in. visionapp Remote Desktop (www.visionapp.com/111.0.html?&ftu=74b201aa0c) is another good alternative. I just stumbled across the visionapp Remote Desktop today from a buddy and I think that's by far the best solution between the 3 discussed here. I was using Terminals since you posted about it and have since ditched it for vRD. Royal TS is the best solution I've found to date, other than the pricy iShadow Desktop ($50 purchase, $25 per year fee), and I keep looking.